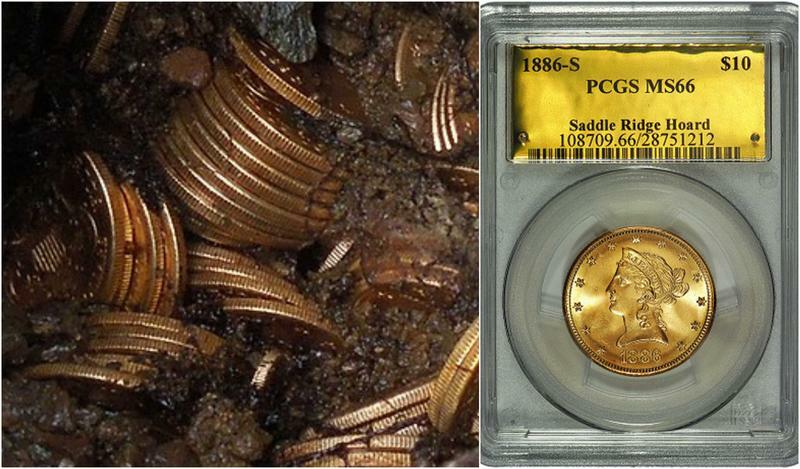 The Saddle Ridge Coins hoard, minted between 1847 and 1894, was discovered on private property located in California Gold Country, near the site of the Gold Rush of 1849. Known only as John and Mary, the middle-aged, married couple have lived on the rural property for a few years and have no idea who buried the coins. They wish to keep their identity, location, and ownership history of their home private, in order to avoid treasure seekers from trespassing on their property in an effort to find more gold. Although the couple had hiked the trail several times, it was not until they spotted a rust-covered metal can poking out of the ground that they decided to explore further. They dug it out with a stick and carried it home. It was so heavy that they thought the can likely held lead paint. On their walk back to their house, the lid of the can cracked open, revealing the edge of a single gold coin. Subsequent trips to the site turned up several more treasure-filled cans. Before finding the trove, John and Mary had noticed some unique features of the area. They recalled seeing an old empty can hanging from an old tree. The can had evidently been there so long that the tree had literally grown around it. Most of the coins are $20 gold pieces, known as double eagles. All of those were made at the San Francisco mint, founded in 1854 to process the nuggets that prospectors were finding in the newly discovered California gold fields. But at least one of the coins came from a much earlier bonanza—a $5 piece known as a Dahlonega half eagle. 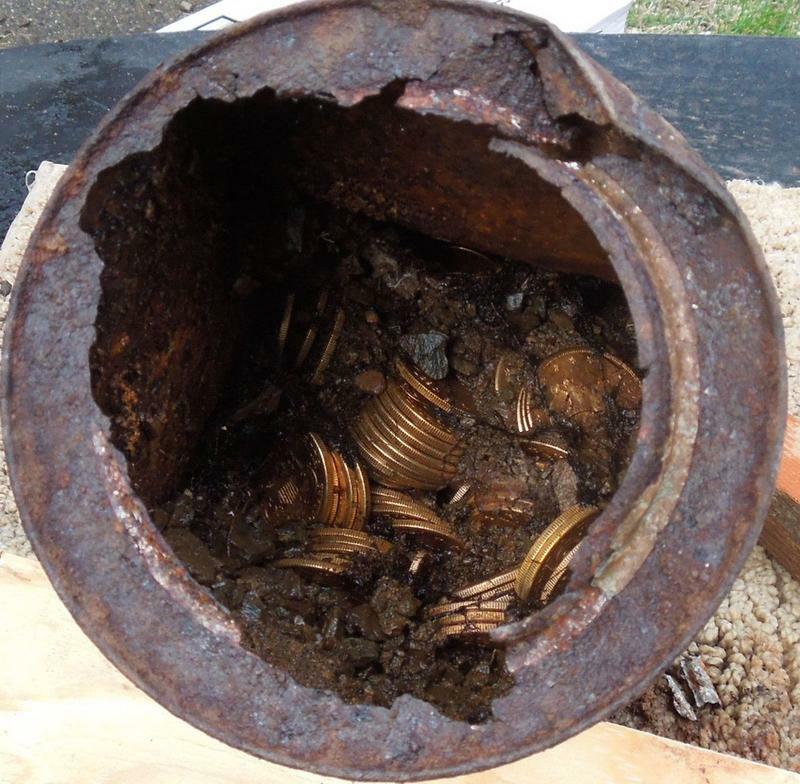 Based on the dates of the coins and the cans they were found in, experts believe that the hoard may have been buried over a span of time, but surely not after the early years of the 20th century. Who would have left a fortune in the ground and not returned to claim it? A prospector who wanted to protect his stash? Not likely. "There were still a few people panning for gold in the 1890s," says Mudd, "but by then companies were doing most of the mining." An outlaw trying to hide the coins while on the lam? Perhaps. Someone extremely wealthy, eccentric, and distrustful of banks? Another possibility. A researcher with the time and interest, who knows the location of the find, might uncover an answer. Property records would record the owner of the land in the late 1800s, says Mudd. That might be one clue. And a search through newspapers of the time could turn up a report of money gone missing. 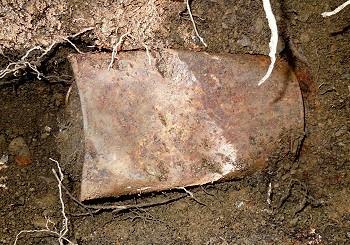 There might even have been a local tradition of buried treasure recorded somewhere.